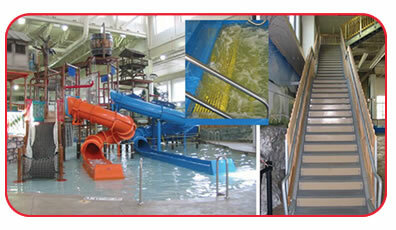 Parks & Recreation | GEF, Inc.
There’s no place for rotten wood and rusty metal in a waterpark or pool. Using pultruded fiberglass materials in place of wood and metal can help slash maintenance costs, reduce downtime and increase the beauty of your facility! Pultruded fiberglass structural materials - including structural shapes, grating, stair treads, decking, handrail, ladders and more - are ideal for use in extreme environments like your waterpark and pool. 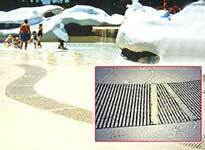 DURADEK® and DURAGRID® pultruded fiberglass grating, including I-4000 and T-1800 which are typically used in the pool and spa market, have been tested and meet UV requirements mandated by the Virginia Graeme Baker Act (VGBA). The grating is the ideal solution for fabricating VGBA compliant drain systems. Stork Materials Technology, an independent testing facility, tested the pultruded grating for tensile strength and impact strength after being subjected to ultraviolet (UV) radiation weathering. The independent testing was performed in accordance with ASTM D638 for tensile testing and ASTM D256 for Izod impact testing. Strength — DURADEK® and DURAGRID® are extremely strong and impact resistant. Low Maintenance — Corrosion-resistant fiberglass with molded-in color will outlast aluminum or steel grating with virtually no maintenance, even when submerged under water. Cost Effective — Pultruded grating is lightweight and therefore easily handled in installation, and costs less to ship than steel grating. 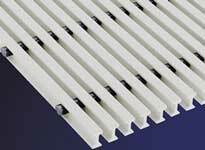 Standard DURADEK® and custom DURAGRID® pultruded fiberglass grating are available in a wide variety of bar shapes and spacings to meet your specific needs. As an added safety feature, pultruded grating can be ordered with a durable non-skid surface, making it ideal for use in wet environments. STRONGRAIL® and custom architectural fiberglass handrail and fencing systems are strong, attractive and withstand even corrosive saltwater environments with ease. 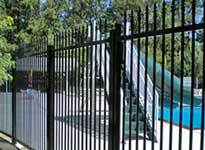 Fiberglass handrail and fencing systems can be made to meet ADA requirements and a variety of colors, pickets and rails can be combined to create a unique fencing system that adds safety and beauty to your property. 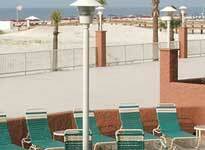 Attractive and slip-resistant STRONGDEK™ was installed adjacent to the pool at the Perdido Beach Resort in Orange Beach, Alabama, in 2003. The deck has weathered Hurricane Dennis, weekly on-deck events and the harsh coastal environment and still remains as attractive and strong as in 2003. Stair treads and stair tread covers will meet the specific requirements of your application. DURADEK® and DURAGRID® pultruded grating stair treads allow water to pass though. DURAGRATE® molded grating stair treads are also available.